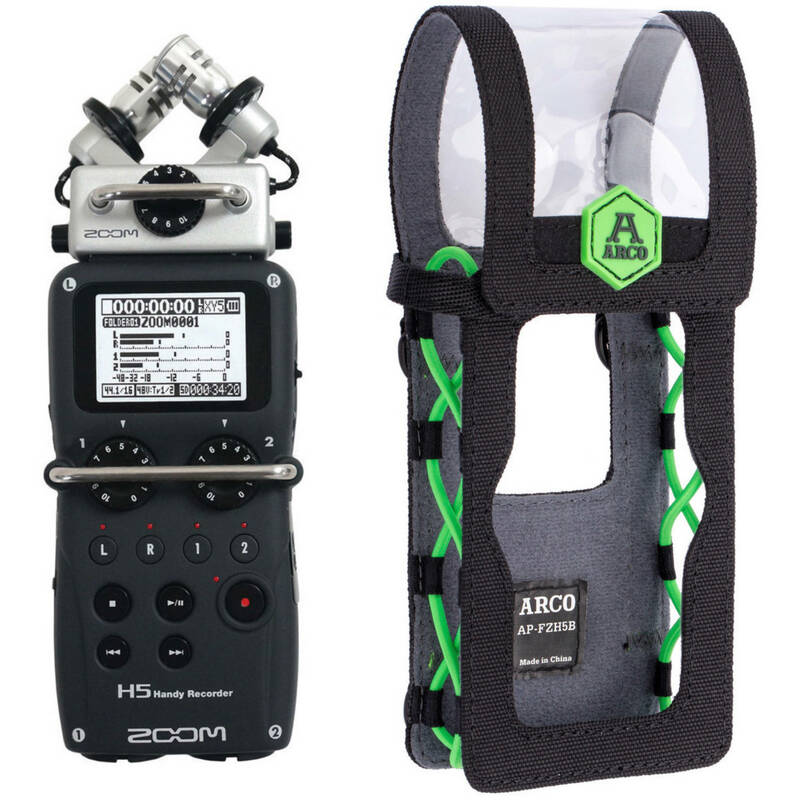 Designed for portable stereo recording—and for transporting your equipment all the while—this Zoom Handy H5 Kit gives you both the Zoom H5 Handy Recorder and a corresponding pouch, specifically designed to keep all the H5's controls and features easily accessible on the go. The H5 recorder features 2x on-board mics positioned in an X/Y configuration, giving you a well-represented sense of stereo field in your ensuing recordings. These microphones are switchable with the H6 line of microphones (available separately) for additional flexibility. Furthermore, the unit is stocked with internal preamps whose combo XLR/1/4" jacks allow you to plug in your own microphones. The case, of course, permits greater ease in portability, as well as simple access to the H5's controls, a protective top flap, a shoulder strap, and a belt clip. In addition to the detachable X/Y capsule, the recorder also ships with a foam windscreen, two AA batteries, a USB cable, WaveLab LE (download), and Cubase LE (download). Box Dimensions (LxWxH) 9.25 x 6.6 x 3.4"
H5 Handy Recorder with Interchangeable Microphone System and Corresponding Pouch Kit is rated 4.0 out of 5 by 1. Rated 4 out of 5 by Faulk from Great! Gets the job done... I consider 4 stars great, except there's one thing that I'd like, a better case, that will allow removing the XY mics so it can be just an XLR recorder without all the extra stuff I don't use. other than that the preamps are quiet and the sound files are just great! Some one out there make a cap for the XY mic connection and case that will protect it when your running and gunning.